Click and Go Table of Contents: Left Pane Explorer-like icons enable you to instantly go to an section of this Title or any other installed Synapse Chemlib product. 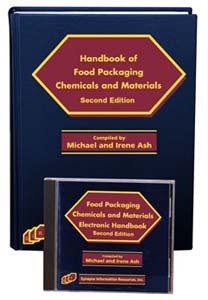 The Handbook of Food Packaging Chemicals and Materials is a comprehensive source of information on chemicals and materials used in the packaging, holding, manufacturing, processing and treating of foods. Although these functions do not entail the addition of materials or chemicals to the food product, the direct contact with the food introduces the probability of migration of the chemicals and materials to the food product itself. Thus, there are regulations by government agencies throughout the world that attempt to specify and limit the use of these base materials (polymers, resins, paper/paperboard, metals, films, textiles) and the adjuvant chemicals used in conjunction with them. Adding to the complexity of the selection of food packaging components is the variety of ways in which in a food product can be contained and distributed. Manufacturers choose a form of packaging based on a variety of factors, e.g., its effect on the marketability of the product, the specific requirements of the product, the type of protection needed, the method of distribution, its effect on shelf-life, and its environmental impact. This reference is designed to function as a material and chemical selection tool for the food packaging and processing industry. It centralizes information on these food packaging and processing components by profiling both trade name and generic products, detailing their properties, uses, use levels, regulatory status, toxicology, sources for purchase, etc. The reader can access the information on food packaging components based on the trade name, chemical components, functions and application areas, manufacturer, CAS number, EINECS/ELINCS number, and FDA regulation numbers. This section provides an alphabetical listing of 4000 trade name chemicals and materials that are used in the manufacture of food packaging. Each entry includes the manufacturers name; chemical/material description; its detailed functions and applications in all aspects of industry; physical properties, such as form, molecular weight, density, solubility, boiling point, cloud point, flash point, pH, freezing point, activity; toxicology, storage, precautions, etc. Keyword Indexes: Comprehensive Index, Trade Name X-Ref, Generic Chemical X-Ref, Manufacturers X-Ref, CAS X-Ref, EINECS/ELINCS X-Ref, Functional/Applications X-Ref., Environmental, Toxicity and Precautions X-Ref. Hyperlinking: Trade names to MFG-Branch and Chemical Component Cross-Reference section, Trade name manufacturers to Manufacturers web sites. This section covers all chemicals/materials that are contained in the trade name products section as well as generic materials with no trade name equivalents. Each entry contains information including the following: CAS (Chemical Abstract Service), EINECS/ELINCS (European Inventory of Existing Commercial Chemical Substances/European List of Notified Chemical Substances), and UN/DOT reference numbers, classification, definition, chemical synonyms, empirical and molecular formulas, properties, toxicology, precautions, storage, uses, use level, regulatory details, manufacturers and distributors (hyperlinked to the Manufacturers Directory in the software). All chemical/material synonyms are cross-referenced back to the main entry. These entries are followed by a listing of the trade name products (hyperlinked to the Trade Name Reference section in the software) that are either equivalent to the chemical entry or contain it as one or more of its ingredients. Keyword Indexes: Comprehensive Index, Trade Name X-Ref, Generic Chemical X-Ref, Manufacturers X-Ref, CAS X-Ref, EINECS/ELINCS X-Ref, Functional/Applications X-Ref., Environmental X-Ref., Toxicity and Precautions X-Ref., Molecular Formula Dir. Hyperlinking: Trade names to Trade name Section, MFG-Branch section, all cross-references (synonyms) to main entries, Generic manufacturers to Manufacturers web sites. A powerful tool for locating the trade names and chemicals based on their function and/or industrial application area. By searching for key functional words such as antioxidant, emulsifier, plasticizer, stabilizer, etc., or a specific application area, such as films, coatings, paper/paperboard, molded articles, the user is directed to the trade names, chemicals, and materials that have that specific function or application attribute. The generic component names are distinguished from the trade names by italic type. An alphabetical listing of the international chemical manufacturers of the trade name products and chemical components is provided in this section. Each entry includes branch locations and contact information. Wherever possible, telephone, telefax, toll-free telephone numbers, E-mail and Internet addresses, and complete mailing addresses are included for each manufacturer. EINECS/ELINCS Number Index contains EINECS/ELINCS number entries followed by a listing of its trade name product and generic chemical equivalents in alphabetical order. The chemical name is in boldfaced type. FDA Regulatory Number Index cross-references trade names and chemicals listed in this reference that meet FDA standards under sections 21CFR 175-178 (Indirect Food Additives that have been approved for articles intended for use in packaging, transporting, or holding food).